Some came on the 9 am ferry, arriving around 11. Others sailed on the 10 am ferry, arriving around 12. Twenty-seven of us in all. The dining room table stretched to its fullest length. 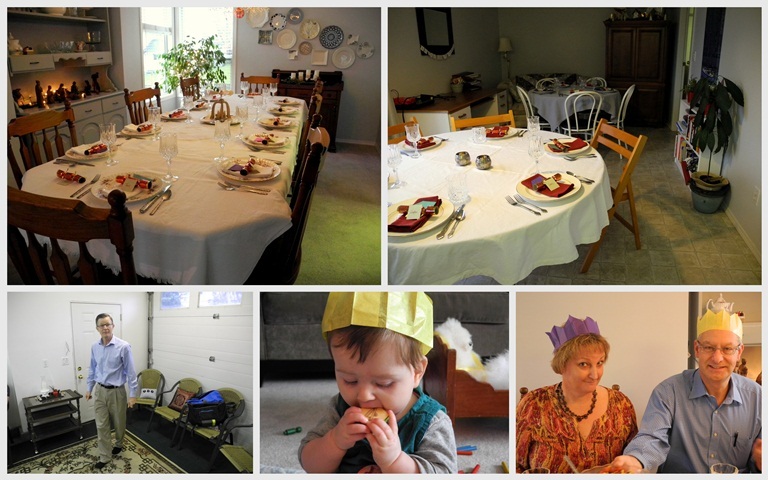 The patio table and our everyday round kitchen table hosted more guests. Since our basement suite is currently rented out, we needed an extra room so, Tim's shop (the garage which our car has never seen), was converted into a Play Area, complete with Lego, and a game console and television. Everyone has had their fill of turkey and ham dinners, we thought. So my girls and I cooked a Mexican themed dinner. Deep Dish Tamale Pie, a Mexican Street Salad, a Corn, Black Bean and Tomato Salad, Guacamole, Tortilla Chips and Salsa were on the menu. For dessert I made 4 jelly rolls, filled with raspberry jam, covered with whipped cream, served with a cranberry/raspberry sauce, and topped with a candied orange slice. We sang Feliz Navidad, opened Christmas crackers and wore tissue paper hats during the meal. Our time together was sweet, but short, as parents, siblings, nieces, nephews and great nieces and nephews headed back to the mainland on the 7 pm ferry after some yummy snacks brought by the mainland folks. I'm so thankful for my family. There was plenty of food leftover - if you come for a visit you are likely to be served a slice of that dessert. I'll be freezing it. What fun! I love the non-traditional theme dinner idea. Great memories. Looks like fun and the menu sounds yummy. Wishing all the best for 2013. Looks like a fantabulous gathering! Sounds like a fun dinner, the menu does sound yummy! I wish you all the best in 2013, Happy New Years! It all looks and sounds divine! What a great family you have. I'd love to have a slice of that jelly roll, believe you me. And I think a departure from ham and turkey sounds fabulous. What a fun family mosaic! We usually like soup after all the heavy Christmas food we eat. Haven't made it yet, but it's on the menu for some time soon. Hope you have a great New year. What a wonderful celebration! And wonderful photos! Happy new year! 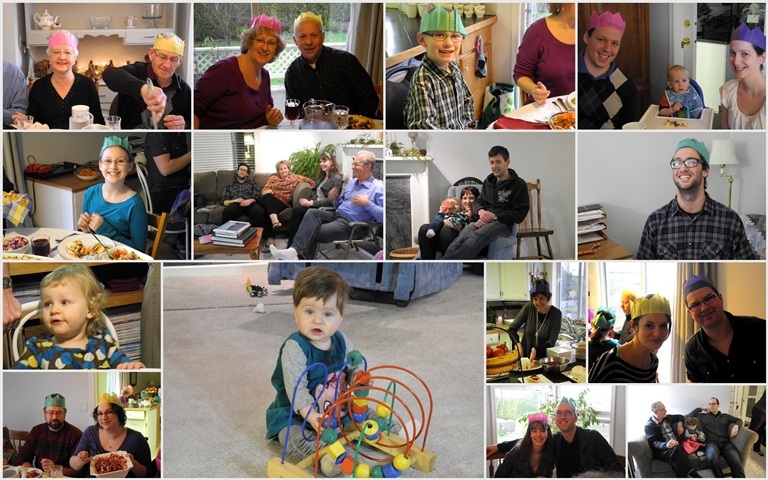 Such a nice family gathering, and I'm glad we're not the only ones that wear the hats from the Christmas crackers! Wow Lorrie it sounds like a wonderful time! I bet you are ready for a bit of a rest as you welcome in the new year! Wishing you many blessings in the new year. Wow you have done well to stretch your rooms to accommodate so many people and it sounds like you had a wonderful time. Just how this time of year should be with family. You live on an island! Thank you for stopping by my blog today to say hi. I wish you and yours a wonderful 2013. Lorrie I loved reading about your family gathering and I agree that a change of theme is a very appropriate way to start the New Year. Your family must have been so grateful to the host and hostess for bringing them all together. there's nothing better than being together again. Your table settings look so elegant but that's hardly a surprise. You do everything with class! Happy New Year! Looks like a real Blessed and fun time.